Popular with families looking for a comfortable and spacious 3-row SUV, the 2018 Nissan Pathfinder offers high safety ratings and a long list of safety features including automatic emergency braking. With its powerful V6 engine and optional all-wheel drive, the new Nissan Pathfinder competes in a crowded SUV market that includes the Honda Pilot, Toyota Highlander, Mazda CX-9, Ford Explorer, Volkswagen Atlas and Chevy Traverse. The reliability of this car so far has been fantastic. I have had this pathfinder since January. The ride is fantastic and it handles really well. The gas mileage is good for a mid size SUV and it has good performance as well. It has multiple USB charging outlets as well as a 110 outlet in the rear. I really love the power liftgate as well as the auto liftgate. The adaptive cruise is amazing and I use it all the time as I drive a lot. The backup camera is nice as well as the blind spot warning system. The only thing that I have an issue is with the doors. They close very easily and sometimes don't want to stay open. I had a 2016 pathfinder and had this same issue. On an incline or with a good breeze the door will close back on your legs. I have put 11, 000 miles on my 2018 so far and it is wonderful. Good value for what you pay, great for a growing family. Windshield wipers need to go faster for safety purposes in intense rain. I like the third row seat. It is roomy and comfy compared to other similar vehicles. I like that it came with more "bells and whistles" for its price than other similar SUVs. It has pretty decent gas mileage. I dislike that the driver's seat moves forward and back when turning on and off the vehicle. I dislike the look of the outside of it. I also have already had a couple lights come on even though it's brand new. It turned out to be a minor computer error within the vehicle. I dislike the windshield wipers because they do not go fast enough when it's raining incredibly hard. Makes me very nervous for safety. The best young family vehicle. So far we have had no problems at all. We only have a few thousand miles on our vehicle though. The ride is very smooth due to the cvt transmission. We get great gas mileage for a non-car vehicle. I absolutely love the different options to hook up my phone or mp3 player to the car for music on top of having Sirius XM. The seats themselves are big and very comfortable, and there’s plenty of legroom even in the middle row of seats. 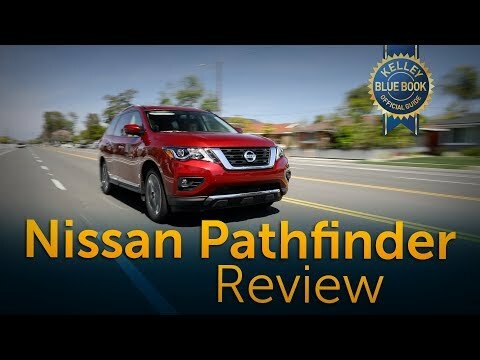 2018 Nissan Pathfinder Review: Just An Average SUV?